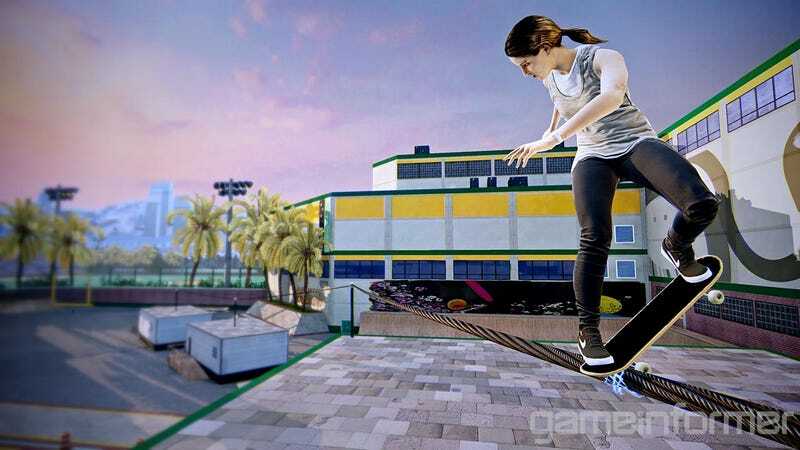 An article in the latest issue of Game Informer reveals that a new Tony Hawk’s Pro Skater game is fast approaching. Let’s hope its not as sad as that last Tony Hawk game. It’s called Tony Hawk’s Pro Skater 5. Tony Hawk will be a playable character in the game. It’s coming out on the PS4 and Xbox One “later in the year,” with last-gen versions to follow. There will be online competitive and cooperative multiplayer. Some of the levels charge up your skateboard with level-specific power-ups when completed. For instance, one level we played had a series of electrified wires atop the roofs of successive buildings. Grinding all of them charged up our board, making it a little faster. Another power-up gives you more ramming power—useful when you want to complete a mission such a clearing a pool full of inflatable objects or hitting a soccer ball through a goal. All nine levels have at least one or two power-ups, Game Informer added. Plus, the power-ups stack up on top of one another. I’m not entirely sure what that’ll look like in practice yet. Read the full Game Informer article for more information and additional screenshots.